Macanudo is one of the most popular cigars in America, and the mild Macanudo Cafe and Gold blends (both of which feature Macanudo’s classic green and white band) are most closely identified with the brand. That popularity shapes the brand’s identity. The upside is the reputation makes Macanudo green label cigars a go-to for mild cigar smokers who know they will get exactly what they want. The commercial challenge has been expanding that successful reputation beyond mild offerings, especially as tastes for many cigar smokers have tended toward fuller-bodied profiles. Macanudo’s Inspirado line first debuted in 2004 for international markets; it wasn’t available in the U.S. until 2014. Keep in mind, unlike in the U.S.—where General Cigar/Scandinavian Tobacco Group (STG) also owns the rights to the Partagas, Punch, Hoyo de Monterrey, and other trademarks that originated in Cuba—the Cuban government still controls those marks overseas. That means Macanudo is far and away the best-known brand owned by STG outside the U.S. This may account for why Macnudo Inspirado was pushed elsewhere. Inspirado Black uses an Ecuadorian Sumatra binder and Estelí filler surrounded by a dark, nearly jet black Connecticut Broadleaf wrapper. Rather than priming and curing the wrapper tobacco in the traditional manner, which is leaf by leaf, Inspirado uses stalk-cured Broadleaf tobacco. In stalk-curing, which has become more common for Connecticut Habano wrapper, the entire plant is cut and the entire plant, leaves, and stalk cure together. The process takes longer but can produce a more flavorful wrapper leaf as the nutrients from the stalk continue to migrate to the leaves during curing. 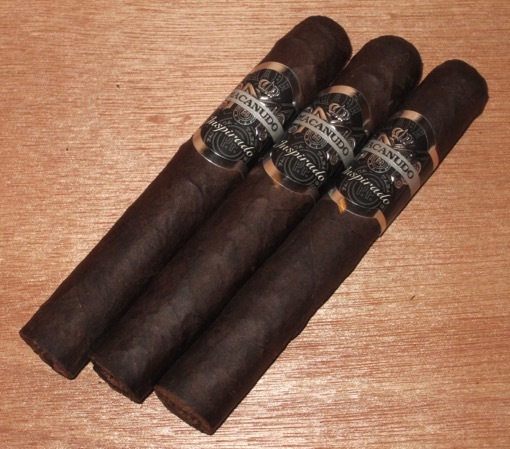 Inspirado Black comes in three sizes: Churchill, Toro, and Robusto. I smoked three Robustos (4.9 x 48), which sell for $7 each. After pre-light notes featuring raisins, I lit the Robusto to find a unique combination of flavors with mole (unsweetened chocolate, smoked paprika, red pepper), bread, cream, dried fruit, and oak char. Those flavors, which combine for full-bodied flavors, coat the palate with an almost velvet-like mouthfeel. The cigar produces thick, aromatic smoke. Except for the strength building slightly, there’s little variation from start to finish, except for a slight sourness that’s evident towards the final third. It’s a complex cigar that’s far from traditional Connecticut Broadleaf flavors. One of the samples I smoked had a notably soft spot, but showed no ill-effects, as all three had excellent combustion qualities including a sturdy, dense light gray ash, even burn, and firm, not overly tight, draw. Since the introduction of the Macanudo Cru Royale and Macanudo 1968, the view of Macanudo as a purely mild cigar line has been outdated, even as the reputation has persisted. The Inspirado line in general, and the Inspirado Black in particular, should fully put the mild myth to rest. There is a lot to like about the Inspirado Black. With unique, complex, full-bodied flavors and excellent construction, the Macanudo Inspirado Black Robusto earns a rating of four stogies out of five. I liked this cigar too. Would love to see you review the White. I mostly smoke darker, more full bodied cigars, but I do occasionally enjoy a Connecticut. That Inspirado White is probably my favorite Connie. Lots of flavor for a “lighter” stick.